I have not had many opportunities to use the Ottolock, partly due to a busy schedule that has limited my riding opportunities, but also because when I did squeeze in an hour ride here and there I didn’t need to lock my bike. I did manage to use the lock three times. You can read my findings here. 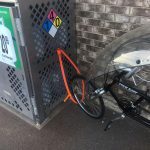 This entry was posted in Reviews and tagged bike lock, Coy Boy, Coy Starnes, Ottolock. Bookmark the permalink.